Motorcyclists and golfers looking to get involved this summer have four chances to help Make-A-Wish South Dakota. Register for Hot Harley Nights, On the Road for Wishes, the Dacotah Bank Golf Tournament, or the Make-A-Wish Golf Tournament to help grant wishes in South Dakota this summer! Over the past 20 years, Hot Harley Nights has raise more than $2 million for Make-A-Wish South Dakota. Now in its 21st year, you can help make this year’s event a success by getting involved. Hot Harley Nights goes from Thursday, July 7 to Sunday July 10 in Sioux Falls. The event will be centered at the J&L Harley-Davidson downtown, but festivities will be happening all over town. Hot Harley Nights includes a casino run, bike parade, live music, raffles, silent auction, and great food throughout the weekend. Bikers can register now for $40 a person to take place in the parade or $25 to enter the motorcycle show. Those who do the parade can take part in the motorcycle show for a discounted rate of $10. There will also be a special raffle for a 2016 Harley-Davidson Softail Slim. Raffle tickets are $25 each, or five tickets for $100. With so many fun activities going on, you won’t want to miss out on Hot Harley Nights! Golf teams can take part in the Dacotah Bank Make-A-Wish Golf Tournament for just $300 per foursome. The tournament takes place at Watertown’s Cattail Crossing Golf Course. Registration begins at noon, with a shotgun start at 1 p.m. The day will conclude with food and prizes following the round of golf. Don’t miss your chance to get involved! Contact Brock or Jennifer for more information at 605-886-0645. Golfers in the Sioux Falls area can come out to the 16th Annual Make-A-Wish Golf Tournament at the Minnehaha Country Club on July 18. Register as an individual for $600 or a foursome for $2,400. All teams will play in a scramble format. Registration includes 18 holes of golf, lunch and two tickets per golfer for the evening’s events. On-site registration begins at 11 a.m., followed by the shotgun start at 11:30. For more information, contact Paul Krueger. 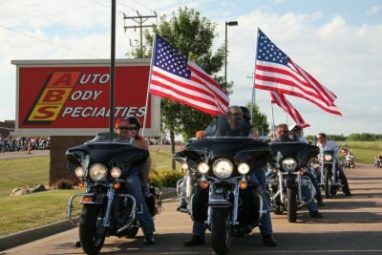 If you’re looking for another motorcycling event following Hot Harley Nights, don’t miss the On the Road for Wishes Poker Run and Charity Ride on July 23. On the Road for Wishes includes a parade, poker run, lunch and more all taking place in the Aberdeen area. The registration fee of $20 per rider helps raise more money for Make-A-Wish South Dakota. Register on-site at Biegler’s C&S Motorsports from 10 a.m. to noon the day of the event. If you find your motorcycle isn’t up for the poker run, parade or Hot Harley Nights, you can still use it to make a difference! Donate your motorcycle or any other vehicle to Wheels For Wishes benefiting Make-A-Wish South Dakota. Your car or motorcycle donation is 100 percent tax deductible and you’ll feel great knowing it helps Make-A-Wish grant more wishes in your state. Donate a car today by calling 1-877-431-9474 or filling out an online car donation form.